Born in Pill, Jon Buck descends from a family of Bristol Pilots, who for generations have safely guided shipping vessels through the waters from Portishead to Bristol. 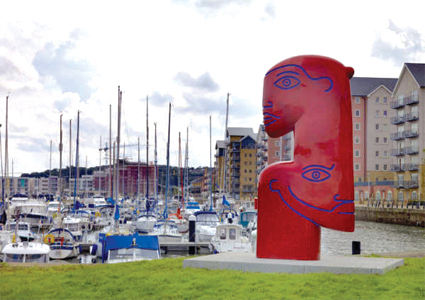 An imposing spot set on the headland overlooking the Bristol Channel will be the remarkable final setting for Jon Buck’s bronze heads, four metres high and vibrantly patinated in red. They relate to those ‘who journey’ and those ‘who wait’, acting as sentinel at the entrance to the new marina. “The inspiration for this work came directly from the physical and historical context of the dockside in which it is placed. 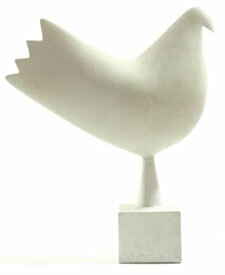 The form of the work reflects the shipping bollards that still exist along the old quayside. Superimposed is a male head looking out to sea and above is his female counterpart facing the opposite direction. This makes reference to the dichotomy that was always present in seafaring communities. Ship to Shore was a type of communication used to connect the two.” Jon Buck. Jon Buck studied at Trent Polytechnic, 1975-79 and Manchester Polytechnic, 1979-80. Following his studies, he was appointed Fellow in Sculpture at Gloucestershire College of Art and Technology, 1980-81 and was the first artist in residence for Thamesdown Borough Cuncil in 1984-85, financed by Southern Arts. Interest in how we relate to the natural world and the making of sculptural objects have always been inextricably linked in Jon Buck's mind. Initially the content of his work was overtly expressed through quite complex and relatively naturalistic figurative compositions. In attempting to draw together, in a more meaningful way, the two elements of his interest, his work has become simpler and more iconic in form. In 2000 he produced a body of work that was shown in an exhibition entitled 'Intimate Connections'. These sculptures look to act as intercessors between our contemporary intellectual-selves and a more ancient sensory, unconscious-self that connects us with our primitive more fundamental natures. Jon Buck has exhibited regularly since 1980 mostly in Europe, America and Britain. Most recent are his sculptures 'Returning to Embrace' shown at Canary Wharf in the exhibition, 'The Shape of the Century: 100 Years of Sculpture in Britain. 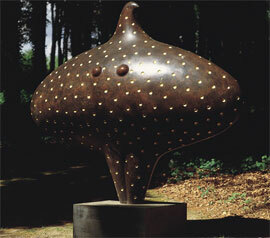 Currently his sculpture 'Goodwood Goddess' is part of the main collection at Goodwood, and the maquette for the piece is included in the exhibition at the Venice Guggenheim Museum, Venice, 2002. He has undertaken a number of major commissions including, the new British Consulate-General in Hong Kong, Deal Pier in Kent, Milton Keynes General Hospital, Canary Wharf in London the West Quay Centre in Southampton and Bristol University's Centre for Sport, Exercise and Health.